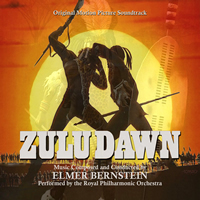 BUYSOUNDTRAX Records presents the original soundtrack to ZULU DAWN, featuring music composed by Elmer Bernstein (THE MAGNIFICENT SEVEN, THE GREAT ESCAPE, TO KILL A MOCKINGBIRD, FAR FROM HEAVEN) for the 1979 historical epic directed by Douglas Hickox (BRANNIGAN, THEATRE OF BLOOD, THE MASTER OF BALLANTRAE), featuring an all-star cast including Burt Lancaster, Peter O’Toole, Simon Ward, Denholm Elliot, Peter Vaughan, Nigel Davenport, John Mills, Freddie Jones, Ken Gampu and Bob Hoskins. Previously released on compact disc by Cerberus Records and La-La Land Records and long sold out, BSX Records brings ZULU DAWN back to compact disc featuring music composed by the great Elmer Bernstein, performed by the Royal Philharmonic Orchestra in London, with a new mastering by James Nelson of Digital Outland, new liner notes by noted author Randall Larson and new artwork designed by Mark Banning. This release has been officially licensed from Cerberus Records.